Front (l-r) Adam O'Rourke, Jake Moriarty, Cian Dore, Mark Kennedy, Eddie Horgan, Sean Gilbert (Captain), Derek Dillon, Daragh Broderick, Cathal Keane, Rici Hanley. Emmets started the Second half as they did the first with a fine point from play aided by the breeze from David Keane. Ballydonoghue found their feet at midfield and began to dominate but were unable to convert from their possession, David Keane again for the Listowel side converted a free from a foul on Micheal Stack. Ballydonoghue built from the back finding Jack Foley again who passed on to Paudie Lyons who inched past Paul Kennedy to leave the sides 2-05 to 2-06 in favour of Emmets. It was Emmets David Keane again to the fore as he sent over two unanswered points one a converted free. As Emmets intercepted a Ballydonoghue Kick out David Keane shot for point again the ball hit the upright to the waiting Bryan Sweeney who shot low to the back of the Ballydonoghue net as Emmets led with 3 minutes to go by 3-8 to 2-06. From the kick out John Keane linked well with Jake Moriarty to sending over another point to leave the full time score Emmets 3-09 Ballydonoghue 2-06. As stated previously this was a great game to watch and highly entertaining. These two teams had met in the North Kerry Minor League final where Ballydonoghue thought them a lot of lessons in football and its great to see that the Emmets boys learned from that and put on such a magnificent display. Mike Flavin Secretary of the North Kerry Board presented the Jotty Holly Memorial Shield to an elated Darragh Leahy Emmets captain. Listowel Emmets and Rathmore could not be seperated in this County Minor League Semi Final, played in splendid conditions in Frank Sheehy Park on Monday last 6th May. The home side got off to a great start where they netted to Rathmore net within the opening minute, however Rathmore got more into the game and lead at half time 2-4 to 1-5. Emmets commanded midfield in the opening quarter of the second half and picked off some lovely scores from Derek Dillon, Jake Moriarty and Micheal Keane Stack. Emmets were once again in the driving seat but a late well pointed 45 by Rathmore brought the game to a draw for the third time in injury time. Rathmore took some good points from the play and went two points clear in the opening half of extra time, Emmets got stuck in again and excellent fielding by Darragh Leahy and defending by Brion O'Donnell and Darragh Broderick kept Emmets in the game, Adam O'Rourke and David Keane took some good points to edge Emmets in front but Rathmore dug deep again and took a great point under pressure to level the game again. Final Score Emmets 2-15 Rathmore 3-12. Well done to the Listowel Emmets Minor team who after a replay victory over a gallant Rathmore side have qualified for the Final of the Keanes SuperValu County Minor Football League Division 3A. Everybody in the club is very proud of each and every one of you for showing great courage, spirit, heart, determination, bottle and bravery. The Division 3A campaign began way back on the 24th of February on a bitterly cold afternoon in Moyvane. This dedicated panel of young and enthusiastic players gave everything to the cause all along the way and their efforts have now been rewarded with a place in the Final. The Final will be against Spa next Friday evening at 7.00 P.M. in Austin Stack Park – Tralee. We would really appreciate it if you could go along to support them. 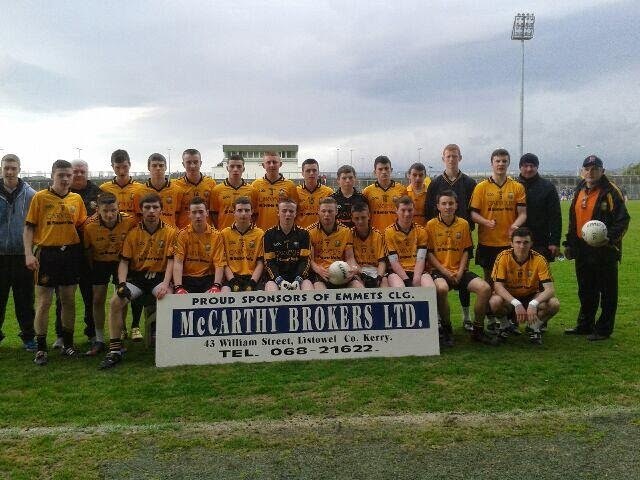 Emmets and Spa met in the final of the Division 3A County Minor League Final in Austin Stack Park on Friday 17th May. Spa and Emmets met in the round three clash where Spa were comfortable winners over the Listowel side. Both teams qualified for the finals with Spa defeating Ardfert while it took Emmets two attempts to get past Rathmore. The pitch in Austin Stack Park was in perfect condition, with a cross field breeze that favoured Emmets in the 1st half. Spa started much the better. Liam Kearney dedicated most of the play from midfield for the Killarney side but excellent defensive work by Daragh Broderick and in particular Brion O’Donnell saw the Spa efforts unfruitful. Emmets opened the scoring with a pointed free from David Keane. Emmets won the kickout but saw Dara Hughes effort trail wide, Derek Dillion who was playing at corner forward won a free in the 3rd minute which David Keane converted to give the Listowel side an early lead. A minute later Emmets had two of their efforts trail wide before some excellent fielding by Jake Moriarty who linked well with Dara Hughes who split the uprights. The Listowel side looked hungry and winning a lot of breaks at midfield and moving the ball well as Michael McCarthy was introduced for Conor Cronin who was struggling in the corner. Liam Kearney kicked a fine free for Spa to opening their scoring on the 9th minute this was followed quickly by a good score from play by Aidan Shepard. Emmets continued to hold an abundance of possession but their kicking continued to let them down as an opportunist shot by Rici Hanley after some good work was well saved by the Spa Keeper who linked up with full back Tim Hussey who went on a blistering run up field to see his effort trail wide. On the kick out Emmets attempt by Darragh Leahy fell short and as Spa built from the back found their way through the Emmets defence and Cormac Kennelly billowed the Emmets net as Spa lead for the first time in the game (1-03 – 0-04), inspired by the goal Liam Kearney won a great ball in midfield and tore through the Emmets defence wining a free which Aidan Shepherd converted, Kearney converted another free a minute later to see Spa move 4 points clear. Emmets David Keane had a chance to convert a free from a foul on Adam O’Rourke but his shot trailed wide leaving the half time score is this very entertaining Division 3A Final Spa 1-5 Emmets 0-4. Emmets began the 2nd half with an early point. Jake Moriarty won possession and was fouled. David Keane stepped up and put over his 4th pointed free of the evening. Emmets needed to respond again and they did a minute later, when Micheal Stack struck low to the back corner of the Spa net – and game on. Liam Kearney stepped up again for Spa and his fielding was excellent to watch as he moved forward was followed and converted the free to edge Spa in front again, this was quickly followed by a good point from the Spa midfielder Shane Cronin who linked well with Corey Doyle to take a Spa two points clear. Emmets refused to give up however, and commanded the majority of possession over the next quarter, but with both defences working so hard but the football was free flowing with scores were hard to come by, Micheal Stack took a good point from play to leave the bare minimum between the sides once again.